Sweet Sewn Stitches: Anthro Inspired Twill Tie Necklace Tutorial! Anthro Inspired Twill Tie Necklace Tutorial! I am guest posting over at DIY Kinda Girl today! 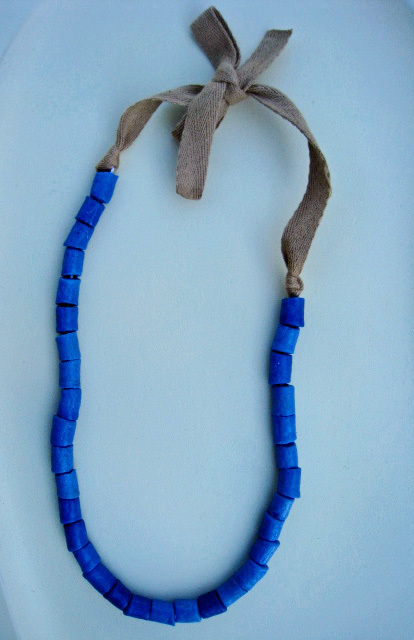 Come learn how to make this simply chic Anthro-inspired Twill Tie Necklace. I love the combination of chic twill and rustic beads! Have you entered the BIG 100 Giveaway?! This is darling! Visiting via I MADE THIS! Following you on GFC. Super idea! The anthro-tutes are some of my favorite and this has joined them! Thanks for the tutorial! I just started making jewelry in April, and I'm always looking for new ideas...especially Anthro knockoffs! I don't have any tips--I just slap it on & go.